The Mountfield HP425 hand propelled lawnmower is powered by a Honda GCV135 OHV 4 stroke engine and has a 41cm/16" cutting width with a 60 litre grass collector. 5 heights of cut between 25mm and 80mm gives a great finish on small to medium sized gardens of around 20m x 20m. The HP425 hand propelled mower is fitted with the Honda GCV135 OHC 4 stroke engine. This is a hand propelled mower which means that the engine drives the cutting and the operator pushes the mower across the lawn. This 41cm/16" lawnmower has an easy recoil start system and an ample 60 litre grass collector, which fits easily onto the durable steel chassis. With 5 height of cut options to choose from an excellent finish is assured on small to medium gardens of around 20m x 20m. The Honda engine runs on unleaded petrol and this mower is very smooth, quiet and easy to start. 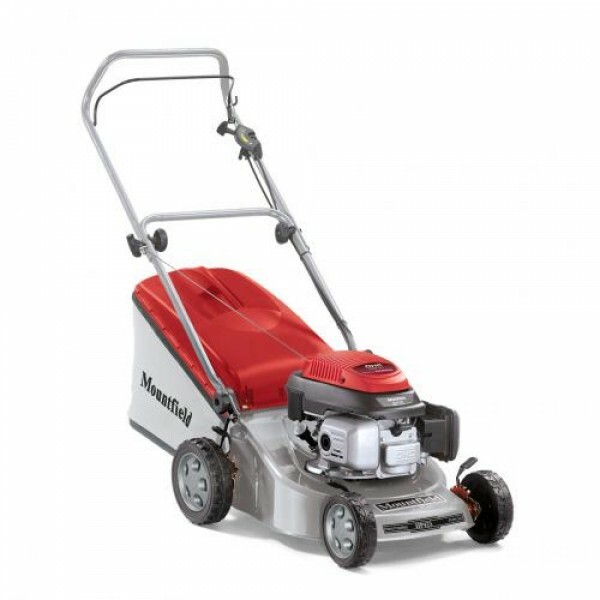 The reputation of the Honda engine is one of absolute reliability and with the lawn mowing experience of Mountfield we have a great machine. This mower is sure to give a neat and tidy finish to your lawn.